Although the direct health risk of medical diagnostic scanning is not unequivocally clear, it is important for patients as well as health care professionals to mitigate the risks of radiation dose. While most of the concern regarding overexposure and cumulative dose has historically been focused on CT, which generally delivers much higher dose levels to patients than standard X-rays, the issue has raised awareness of a patient's cumulative lifetime dose across all modalities that use ionizing radiation—CT, radiography, and angiography. An example is Samsung's GC85A premium fully digital X-ray system, which provides the same image quality with one-half the radiation. Deborah Chung, marketing manager of health care at Samsung Electronics America, says Samsung's image postprocessing engine, S-Vue3.02, provides spatially adaptive multiscale processing and advanced denoising technology. "The new system delivers the same image quality as the predicate device but with half the radiation exposure," Chung says. "The key is Samsung's cutting-edge denoising processing, adopted for the new engine, which reduces noise from the noisy low-dose data while preserving the details of the object being imaged." The dose reduction in digital chest radiography is based on limited phantom and clinical study results for Samsung's GC85A and GM85 systems. Hetal Patel, MD, a radiologist at Alamance Hospital in Burlington, North Carolina, says the low-dose image quality on the GC85A equipment is excellent. "The retro cardiac region is well visualized with excellent penetration, and the rest of the anatomical structures are clearly demarcated," Patel says. "Also, bony structures were well delineated. Low-dose imaging has a similar or better image quality than regular-dose images." "The value of the EOS system is multiple: value in patient safety through a dose reduction that can be two-fold to 10-fold, compared with DR and CT; value in efficiency through a much faster exam—up to 75% savings in exam time; and value from a better-informed treatment thanks to our unique weight-bearing 3D data," says Marie Meynadier, CEO of EOS imaging. 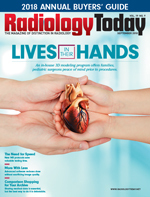 "Reducing health care-related radiation exposure is a metaphorical cornerstone in medical ethics and the standards exhibited in the Hippocratic Oath," says Christopher J. Smith, CNMT, RT(N), administrative director of radiology and imaging at the Hospital for Special Surgery (HSS) in New York. "While incidental exposure from X-rays has minimal to no patient risk, there are patient populations, such as adolescent idiopathic scoliosis patients, that may receive serial X-rays for many years." "At HSS, we see dose reductions equal to approximately 50% of comparable digital X-rays," Smith says. "EOS also offers a microdose feature that can further reduce patient exposure to near-background levels, which HSS will be exploring to offer for some patient cohorts." "The outcome is an X-ray image with good resolution, sharpness, and 65,000 gray values," Smith says. "This means that the X-ray images can be windowed similar to the way radiologists do for specific body parts in CT. Next, the X-ray beam is collimated just after the X-ray tube and passes through a shielded horizontal slot that is 500 microns high. The resultant fan-shaped X-ray beam limits the volume of the body exposed at each moment and, thus, drastically limits the total number of aberrant X-rays, the 'scatter,' exiting the patient and entering the gas detector, where it would degrade the image sharpness." Steven Eisner, senior product manager for Konica Minolta Healthcare Americas, Inc, says the company's AeroDR family of digital flat panel detectors—AeroDR HD, AeroDR XE, and AeroDR LT—utilize a combination of high detective quantum efficiency, high spatial resolution, and REALISM image processing software to contribute to improved dose efficiency. "REALISM is our next-generation advanced image processing software that provides superior visualization of structures within soft tissue and bone within the same image," Eisner says. "It delivers a new level of clarity and detail in X-ray imaging that improves the sharpness of fine details, enhances visibility of hard-to-penetrate structures, and delivers excellent visibility of high-contrast images. This translates to the ability to generate more information with fewer exposures per exam as well as avoid the need to retake images due to poor image quality." "In the wrist, where there are many small bones, I immediately noticed the fine details and sharper images allowing me to see the fine details of each bone," Lemke says. "The images were so crisp the bones just popped [off the image] and the edges and trabeculae of every bone were very clear." "Department managers are concerned with dose, and AeroRemote Insights provides the analytics, via interactive dashboards, they need to manage their AeroDR assets and deliver a better experience for patients," Eisner says. "Over the last decade, with the increase in system connectivity and the more recent emergence of [the Internet of Things], we've tapped into our experience and expertise to be the first to deliver analytics in DR to our customers." "The first layer is we measure in fine detail how the lungs move as the subject breathes, and then, once we have that information as to how the lung tissue is moving, it's actually a relatively simple step to then calculate what the air flow is that creates that lung tissue motion," he says. "So, we can create high-resolution maps of airflow, of ventilation in the lungs. We think of this as a brand-new modality, but we just use older X-ray equipment so we can do low-dose X-rays and apply the algorithm and generate this new, rich data." "We create a 3D image of this lung tissue motion," Fouras says. "The old sort of CT way works by taking hundreds of images around the outside of a patient to reconstruct the 3D CT image. We're actually able to do that with as few as three views. The closest sort of competing technology in this space would be a 40-slice CT, which is going to be substantially more dose than two chest films." "Reducing dose for our patients begins before the scan. Software and the 'cloud' are increasingly playing a role in limiting the number of unnecessary scans and repeated scans within a short time interval," Bhatti says. "From what we know about Moore's law—the observation that the number of transistors in a computer chip double about every two years—we have seen dramatic improvements in CT scanners." "Customization of radiation dose using automated exposure control software on our CT scanners helps decrease unnecessary dose," Bhatti says. "The patient's size and shape is measured and calculated for the specified scan protocol, and the dose delivered through the 360 degrees of the scan may be modulated depending on soft tissue thickness at a given slice level." "Unfortunately, the more we decrease the dose, the more noise or blurriness we encounter," Bhatti says. "To deal with noise, postscan reconstruction software is used to produce diagnostic quality images by improving spatial resolution." The center's Canon Aquilion CT scanners select the dose based on patient size, exposure settings, and type of scan being performed. Iterative reconstruction software on these scanners optimizes the images. "When a patient undergoes a CT scan, they deserve to have the highest-quality scan using the lowest dose possible. The ALARA principle of responsible dose management guides our approach," Bhatti says. "We also fully participate in the Image Gently campaign to reduce pediatric CT dose. Our equipment helps us adhere to these principles by giving us the tools necessary to limit dose while producing high-quality images."